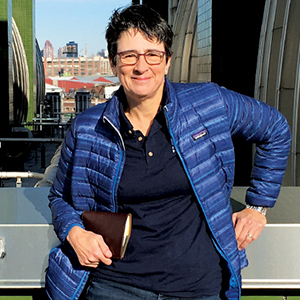 Pam Elardo works to optimize New York City's aging wastewater system while enabling and empowering women around the world. When someone flushes a toilet in New York City, that wastewater enters a vast 7,400-mile network of pipes, passing though 96 wastewater pump stations and ultimately ending up at one of 14 wastewater resource recovery facilities that produce clean water and valuable by-products. For a city of 8.5 million residents who together send 1.3 billion gallons of water a day down the pipes, all of that is an important but hidden operation. Managing the entire process requires a special mix of expertise and skill: the engineering experience and know-how to optimize the system and the managerial and people skills to articulate the mission and to motivate employees to fulfill it. That’s an enviable combination for any engineer in a leadership position. But for her tenacity and the support of progressive mentors, the woman now at the helm of the Bureau of Wastewater Treatment, deputy commissioner Pam Elardo (’83), most likely would never have become an engineer, much less one with such responsibility and authority. Growing up in Addison, Illinois, in the 1970s, Elardo was interested in environmental science and had a sense of what it meant to be an engineer, but she did not know anyone else in her high school class who wanted to study engineering. Undeterred, she applied to Northwestern to study chemical engineering. There, she became part of a new wave of young women interested in the field. Still, she faced obstacles, including one in the Technological Institute, which ironically related to her eventual field of work. Times have changed. This year’s freshman class at the McCormick School of Engineering is 38 percent female. Despite the challenges, Elardo found research opportunities through Professor George Thodos, who provided clear mentorship. She also found a special niche with the Northwestern women’s basketball team, which achieved Big 10 conference championships and made it to the NCAA national tournament during her years on the squad. When she graduated in 1983, Elardo put her engineering skills to use right away as a Peace Corps volunteer in Nepal. For a young woman who had never been outside the United States, arriving in a small, remote Nepalese village without electricity was eye opening, to say the least. She had to travel to Katmandu — about 150 miles by foot and bus — just to call her mother, which she did twice a year. Once in the country, she quickly got to work designing and constructing gravity-fed water supply systems for several villages that had no clean water source nearby. Designing these systems was especially important to her because often it was the girls who spent their days traveling to and from water sources instead of going to school. Returning to the United States in 1986, she landed a job as an environmental engineer in the Washington State Department of Ecology in Seattle, helping to implement regulations related to the Clean Water Act. Over the next 15 years, she moved up within the organization, earning her master’s degree in environmental engineering at the University of Washington along the way. In 2001, she joined Washington’s King County Wastewater Treatment Division, moving from regulation to implementation of technologies to create better environmental outcomes. There, she learned capital planning, permitting, and asset management, eventually ran the West Point Treatment Plant, the largest in the state, and then became the director of the entire division. Along the way, she never forgot her time in Nepal. She co-founded the nonprofit Living Earth Institute, which raises money to build water supply and sanitation systems in developing countries. In 2016, Elardo moved into her current role, where she found herself dealing with a much bigger, older system. New York City built its first wastewater treatment facilities in the 1890s, and Elardo was anxious to bring in experience with new technology and optimizing processes to reduce greenhouse gases and make the business more sustainable.